Dear supporters of the Coral Sea Foundation and friends of the Ocean, Welcome to our first Coral Sea News Update for 2018! Straight to the good news – the coral reefs of West Papua, Eastern PNG and the northern Coral Sea have largely escaped bleaching over the last two hot summers, and the coral cover was looking fantastic in most of the places we surveyed in October and December 2017! The image below is a 3 shot pano from Mavara Bay on the East Coast of Bougainville. While aboard the expedition vessel True North, we surveyed 43 sites between Mapia atoll in the West, and Bougainville in the East, collecting some 12,000 images of the coral reefs. Check our Coral Sea Visions video, which gives a good idea of the reef condition and the incredible fish diversity, as well as some beautiful footage of the Whale Sharks in Cenderawasih Bay, West Papua. Educating women is a practical way to achieve positive outcomes for the environment. 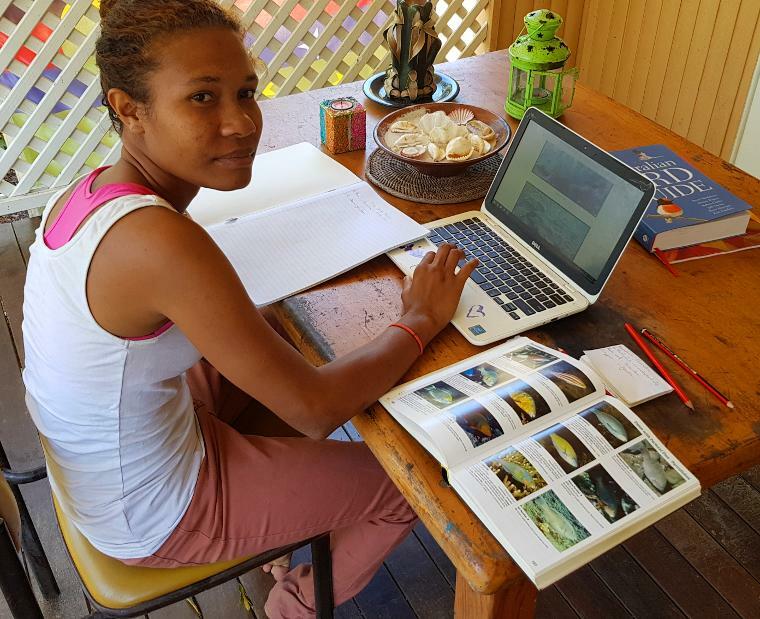 Our Sea Women of Melanesia training program brings promising female marine biology students to Australia for training in SCUBA diving and reef survey techniques. These women then return to their home islands to help us identify locations for marine reserves and begin the community consultation process. We had good success with our first phase of training in 2017 with Lorie Pipiga, a young woman from PNG, and the second phase with additional students will be starting soon. Lorie came to Magnetic Island for three months in the latter half of 2017, and was able to complete her SCUBA training from Open Water Diver through to Rescue Diver, and begin her Divemaster studies. She completed marine biology training in reef fish and coral identification, GPS navigation, and the use of underwater visual census techniques. Lorie would love to attend James Cook University and study marine science, but the 3-year degree for an overseas undergrad student costs more than $100,000! Given the impossibility of raising that sort of money, we decided to harness Lorie’s drive and determination and bring her to Magnetic Island for direct training in the skills she would need to work with the Foundation in our Melanesian development and ecotourism programs. We successfully crowd-funded the training project and proved the cost-effectiveness of this approach, with around $2,500 covering costs for her three month stay in Australia. Furthermore, Lorie was able to return to her home around Fergusson Island in December and begin talks with the local villages regarding the setup of a marine reserve at Oya Niu reef, one of the best reef sites we have ever seen in the Milne Bay area. Interest in the training program has been very pleasing, and I am happy to report we have raised sufficient funds to bring Lorie and another student, Yvonne Wong from the Manus area, back to Magnetic Island for a second phase of education in the first half of this year. I received an email from Father Anthony Young, Lorie’s former headmaster at the Hope Academy in Alotau, and he thanked us for the work and said that Lorie’s experience has inspired a whole school full of young people to work harder at their studies and has strengthened their aspirations for following their own dreams. Educating girls is crucial for social development in developing countries, and I’m really hopeful that Lorie and Yvonne will be the start of a wave of empowerment and change for the young women of Papua New Guinea. So a huge “thank-you” to all those that have supported the training program so far, your donations have made some really great things happen for these young women. We will keep you informed on progress through our upcoming editions of Coral Sea News, and via our Facebook and Instagram pages. Please continue to spread the word about the Sea Women of Melanesia training program through your social and digital media networks. Read a recent article on the program by Deborah Dickson-Smith at Dive PlanIt. Visit our Sea Women of Melanesia donation portal if you would like to support this work. Our recent surveys around northern New Guinea found many incredible coral reef sites with exceptionally high coral cover, and virtually no evidence of bleaching damage. This region contains the most diverse coral reef ecosystems on the planet, yet there is very little information on the condition of the corals. Highlighting this deficiency, a recent influential paper in the journal Science which reviewed bleaching frequencies at 100 locations around the globe, was only able to obtain information from one site (Kimbe Bay) across 3,500km of the eastern coral triangle between Halmahera in Indonesia and Solomon Islands (green oval below). My diving activities through the Indo-Pacific have gathered 40,000 high resolution images of the reef community at 160 locations over the last 12 years, and an extensive part of that collection includes the Eastern half of the Coral Triangle from Raja Ampat through to the western Solomon Islands (map below). This data-set is unique and of immense scientific value. Given the widespread interest in the responses of coral reefs to bleaching and climate change, and the conservation value of the Coral Triangle, I think it is vital that this body of information is made available to scientists, managers, policy makers, and anybody with an interest in coral reef ecosystems and how they are changing in this modern world. To this end, we are working with a specialist web design and GIS consultant to develop a user-friendly software system coupled with a Google earth interface that will allow users to browse and view the imagery according to geographic location and year of collection. The images will allow identification of corals to taxonomic family and permit measurements of living coral cover, providing an important record of the status of these special coral reefs. Creating a software system to handle 220GB of digital information and 40,000 images requires some expertise, and we estimate that development costs will be around $8,000. Please visit our Coral Sea Foundation Image Library donation portal if you would like to support this work. The Coral Sea is particularly suited to operations with a multi-hull expedition vessel that is powered by renewable energy from the sun, wind, and biofuels. The trade winds through this area are strong and consistent for 9 months of the year, allowing a large sailing multi-hull to achieve cruise speeds of 15-18 knots and making 350km overnight passages a reality. Furthermore, many of the Melanesian islands were planted with coconuts after the second world war for copra production, and that coconut resource is a valuable source of biofuel. Our team has many decades of combined experience in marine operations throughout the Indo-Pacific, and that expertise has been focused into the design of a vessel suited to our ecotourism and scientific operations around the remote areas of the Coral Sea and Solomon Sea. During 2017 we completed the main elements of the 42m catamaran design in conjunction with One2Three naval architects, and we are now well into refining the itineraries and operating models for this exciting vessel. The yacht will be in International LY3 survey for 16 passengers and 10 crew and equipped for two-week remote area voyages around the Coral Sea and Islands of Melanesia. Power will be supplied from an advanced hybrid system that draws on wind turbines, regenerative sail-drives, solar panels, and an onboard biofuel conversion plant which will produce biodiesel from coconut oil sourced from our partner communities. Twin 8m jet-tenders will allow all 16 guests to participate in simultaneous diving activities, and a unique tender docking system will mean safe transfer of passengers and gear in and out of the tenders, regardless of weather and sea conditions. The vast 18m beam of the vessel allows plenty of space for each guest’s individual dive gear cubicle on the aft sports deck, and dedicated seawater flow-through systems permit storage and study of live marine specimens. The 8 guest cabins are spacious and very comfortable, all with their own en-suite bathrooms and digital workstations, and the interior of the ship features a modern dining area and lecture theatre space. Our yearly itinerary involves an anti-clockwise circumnavigation of the Coral Sea, from the Swain reefs of the southern GBR to New Caledonia, then north through Vanuatu, The New Hebrides, Solomon Islands, and south-eastern PNG. We will explore Cape York Peninsula and the Far Northern GBR in the autumn, and the central GBR in the latter part of the year before the wet season kicks in. The vast number and quality of the reefs and Islands in this area, and the fascinating seafaring cultures of the local people, ensure some very exciting voyages to come! Our senior captain and team member Andi Ross and his wife Gemma will be taking their 46ft catamaran "Paws" to New Caledonia and Vanuatu immediately after the cyclone season to continue surveys of the reefs and potential ecotourism sites in that section of the Coral Sea. Through our Sea Women of Melanesia training program, we have begun the process of establishing the relationships with the local communities through the islands of the Coral Sea rim that will facilitate our ecotourism and scientific activities. Our plan is to develop key ecotourism nodes through the north-eastern arc of the Coral Sea which combine excellent coral reefs, abundant coconut biofuel resources, and communities with stable leadership that are keen to develop marine reserves within their traditional sea country and participate in our sustainable development initiatives and regular visits by our expedition vessel. Our team members have considerable expertise in delivering programs in clean water & hygiene, clam and oyster aquaculture, and marine reserve management through the tropics. We believe this skill-set in our personnel, combined with the unique capability of our vessel, gives the Foundation an opportunity to assist remote communities in Melanesia toward positive and environmentally sustainable development, while safeguarding the ecological integrity of some of the most biodiverse coral reefs on the planet and some of the most amazing dive sites. Please contact me directly for more information on the vessel and partnership opportunities. In July 2017 Dr Rick Braley and I stayed at the Lizard Island Research Station and re-surveyed the giant clam populations at two sites in the Lizard Island lagoon. These areas had previously been surveyed in 1985 and 2009 and this data-set now represents an important long-term record of the population dynamics of these endangered animals. Despite Lizard Island recently having been affected by two severe cyclones and two thermal bleaching events, we were pleased to find populations of the largest species, Tridacna gigas, had increased by about 30% over the last 8 years. While surveying the giant clams we noticed hundreds of juvenile corals which had settled on the leeward side of Lizard Island, representing the start of the coral community recovery after the mortality during the recent bleaching events. We were able to photograph 489 of these juvenile corals, and close analysis reveals at least 25 species and several size classes, indicating recruitment over at least the last three summer spawning seasons. We are currently preparing this data for publication and it will provide a valuable insight into the recovery potential of the coral reefs from this area and the resilience of corals to bleaching. We are thrilled to announce a partnership with the musicians from OKA, who have agreed to our use of their music on our videos and other digital media. Blending the sounds of didgeridoo, flute, and percussion, OKA draws upon their indigenous connection to place and country to create their signature feel good Australian earth sound, an irresistible blend of influences spanning house, big beat, reggae-dub, Roots, Jazz and world music.